The other week Ashley over at CSN Stores (they sell things like dining room tables) contacted me about doing a review. It will be coming shortly. I’m very excited because I really need this kitchen item that I’m going to get to review for you. So stay tuned. Unfortunately I can’t review dining room tables because our apartment is too small to have one. 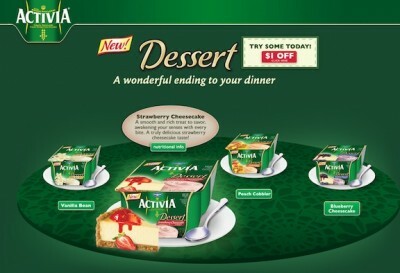 Just FYI, by posting this I get an entry into a contest hosted by Foodbuzz and Activia. And YOU get $1 off dessert. It’s win-win, no? 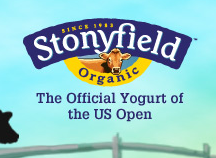 Another company contacted me recently too – Stonyfield (who is sponsoring the US Open) is hosting a contest where you pick your favorite flavor (out of two) each day. Each vote gets you an entry to win a year of free Stonyfield yogurt. So if you are a yogurt person make sure to vote every day to get lots of entries. I voted yesterday (Strawberry Oikos v. Cherry Vanilla – I chose strawberry). The other week I talked about how French women (Europeans in general really) don’t eat emotionally and they’re not emotional about eating. But this comment made me realize that I might be wrong about that. French women are actually very emotional about food – but in a good way! Ice cream cake on my birthday. Dessert with my husband even when I’m already full. Street meat (don’t knock it til you try it) at a street fair. Tasti D Lite. Anytime, anywhere. Soft serve ice cream with sprinkles on a summer day after a softball game. So yes, I attach emotion to these things, but I don’t think that’s a bad thing at all. Sometimes you should enjoy food not just because it tastes good, but because it makes you happy. Sometimes to eat intuitively you have to eat when you’re not hungry just because it’s appropriate. If you’re eating with other people you compromise. If you are about to work out and you’re not hungry (or if you finish a workout and you’re not hungry), you still have to fuel. Sometimes you have to wait an extra hour and you get hungrier than normal. It’s not the end of the world! The key word here is sometimes. You can’t plan everything before it happens, so just let it happen and worry later. Later (this week I hope) I think I’m going to do a post about skincare. Does anyone have any skincare questions for me? Anything you want me to research or summarize? I learned a lot from my facialist last week and I want to share it. Ice cream makes me HAPPY! I can’t eat it often due to allergies, but I am more than willing to suffer the consequences every now and then! I love your approach of sometimes!! it summarizes exactly what I feel about food in the last few months (since I went back to China) and it’s just a great feeling to finally finish the war against food and make it our friend! 😀 Sharing food is my # 1 happy things related to food! skin care question? I have one. How to deal with stressed caused acne? i’ve been breaking out a lot lately because of work stress. @Coco: Yay! Okay – I think I can definitely give some good tips for stress-induced acne. I had that a lot this summer 😉 But my skin is much better now. I’ve discovered though the practice of “EATING IN THE PRESENT MOMENT” (being totally mindful, not allowing my attention to wander off into any form of thought) opens the door for genuine happiness no matter what the food. Then, there is no happiness in the food, there is just…well…happiness. The food is ‘gravy’ (pardon the pun). In the practice of mindful eating, I work at keeping attention and perception in the here and now; centering my attention – detaching it from whatever thought may have been going on and bringing it back into the room with me so that I know that I know that I know where I am and what I am doing. Once I’ve shaken myself from mental slumber, I slowly sit to table, breathing deeply, letting go of any physical tension by allowing my attention to move about my entire physical form in order to detect tension, shallow breathing, anxiety, etc. Once I discover any such, I breathe deeply and release them purposely, and do not commence to chowing down until I’m ‘right’. Once I’m in the centered, near-meditative and utterly alert state of mind, quieted (so to speak), I slowly take in the sight and aroma of the food, slowly, fully, as though that were the only thing that exists in the moment for me. I give it ATTENTION, so that I may experience the richness of it. Then, slowly, I reach for the utensil, and, slowly, put the first bite of food on it and bring it toward my mouth. The entire time, I hold my attention in the present moment, declining the tempting invitation of any thought (bearing content of past, present, or future – “NO THANKS, I’M BUSY NOW!”). When the first bite goes into my mouth, I give it a moment before I start to chew. I allow the flavors of the first bite to paint my tongue and my senses as I breathe in slowly. Sometimes that can be a staggering experience, to finally realize the effect of a food’s flavor on the body and how your physiology truly reacts to it. Often, you can sense things in your body that give a glaring clue as to why we overeat, or why we hurry. Keep watch for the sudden onset of tension or impatience or the temptation to drift of into thought, the state of which causes us to eat in ways that deprive us of food’s genuine enjoyment, and also deprives us of the body’s natural signals of fullness and satisfaction. The reason why so many of us overeat is because we’re lost in mechanical thoughts and don’t listen to our bodies. As I continue to eat in this way, my body tells me clearly when it has had enough of so rich an experience, and I often find that I have food left over (of course, not being a tiny fella, I have plenty on the plate initially). The benefits go way beyond merely immersing one’s self in the experience of the meal, but has to do more with the expansion of self-awareness, especially in noticing and dealing with thoughts and impulses that affect nearly everything we do throughout the day. It’s a door to letting go of a lot of hidden pain, and through that door, in the moment one walks through it sitting there at the table, lies happiness. Thanks for the wonderful post! @T. Lavon Lawrence: Thank YOU for a wonderful comment! I enjoyed reading it very much. You are absolutely right – self-awareness is critical to finding happiness in not only intuitive eating but in everything we do. Loved your description of how you sit down to and eat a meal. Very inspiring. soft serve with sprinkles make me happy, its just so pretty! my mom loved caldbury fruit and nut chocolate bars, so much so that when she was in the hospital before she died, she begged my dad to sneak her some (i dunno, they had this weird no outside food rule). I think of her when i see those bars. Ice cream cones remind me of my dad cause he would take my out for ice cream every sunday as a kid. And there is something about challah bread that makes me feel good inside. maybe its cause I’m a jew, but I think its such a special looking and tasty bread. All i can say im blessed with good skin, and i never wash my face (except in the shower). @Eden: so actually, one of the tips is to *not* wash your face a lot. I haven’t washed my face with anything but water and lemon juice since Friday and my skin has never been so clear! maggie! really? not wash your face very often? I have oily skin so i can’t get away with that… what did the facialist say about the scrubs? @Pearl: You would be so surprised! My skin is *very* oily. What happens though with oily skin is that when you try to dry it out it just makes even more oil and then gets clogged and that is how whiteheads happen. She said do NOT use anything drying at all; you need to actually moisturize (but with oil free lotion). I will definitely go into more detail. I thought she was crazy but it’s actually working. The first day it was weird to not want to put stuff on to get rid of the oil, but after a day or two my skin stopped being quite as oily. The other thing is that you have to NOT touch your face at all. That is a bad habit of mine that I’m trying to break. Hey! I got your email! 🙂 yay. @Sylvia: I adore persimmon. It’s my favorite fruit, for sure. Oh yes- sometimes I indulge because it’s an occasion. Yesterday a co-worker made cake because it was her birthday. I ate a little bit because I know she put the time into and it was a cause for celebration. Eating out makes me happy … a good steak @ the Outback or a slice of pizza and Caesar side salad from my favorite pizza bistro … even a juicy burger and fries. I need to work on discovering joy through eating at home. I’m trying. One thing I’ve been enjoying a lot lately is Banana Ice Cream: Just a frozen banana blended with 3 Tablespoons of milk and some walnuts or peanut butter. Last night I mixed in both peanut butter and cocoa powder. Yum!